The Love Life of an Asian Guy is a Facebook page where an Asian man Ranier Maningding gives his perspectives on issues pertaining to race. This Facebook page is immensely popular and over 200,000 people like or follow this page. Ranier and the other people who moderate this page have a problem with anti-semitism that reflects how the Western Left regards Jews. The behaviors exemplified by the Love Life of an Asian Guy team need to be addressed so that the radical Left can learn how to work with Jews and not perpetuate centuries old stereotypes about Jews. 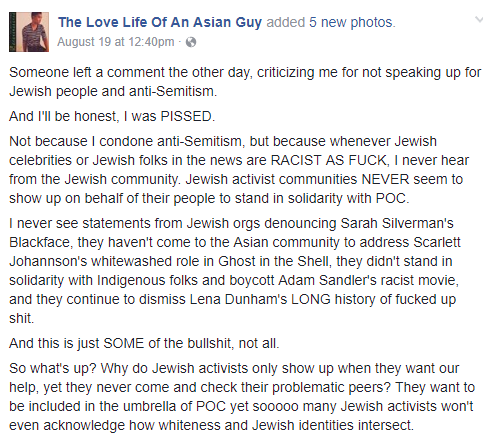 The Love Life of an Asian Guy page has had a reputation in Jewish Facebook spaces of banning Jewish people who call out the Love Life of an Asian Guy team when they are inadvertently anti-semitic. In June, when Otto Warmbier was released by the North Korean government, Ranier made a satirical post on NextShark saying that Otto was a neo-nazi gang member. It was then posted on The Love Life of an Asian Guy and Jews were angry because Otto was a Jew and calling any Jew any form of Nazi is really bad form. Instead of addressing the issue, The Love Life of an Asian Guy moderation team was blocking Jews who were commenting on the issue from posting on their page left and right. This was the first issue but something that seemingly the Love Life of an Asian Guy team did not learn from at all. 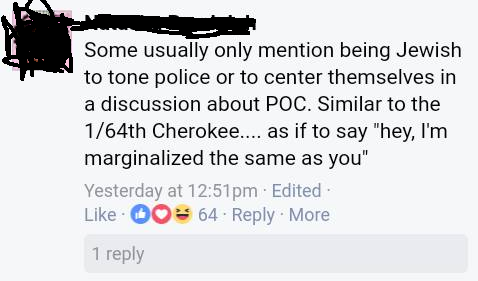 Solidarity for oppressed groups should not come from how much they do for you but because oppression is wrong. The moving goalpost here for support for Jewish people based off of how much they support people of color (as if all Jews are white) is pretty terrible in and of itself. A lot of Jews (both white jews and jewish people of color) are racist and that does need to be addressed. Racism among Jews needs to be addressed in a way that doesn’t erase Jewish struggles which The Love Life of an Asian Guy is doing here. Here is where I come in. My issue with this post was the accumulating anti-semitic comments on the post that nobody on the moderation team was addressing. So I asked why this was the case and posted that I would accumulate screenshots of the anti-semitism and explain it. 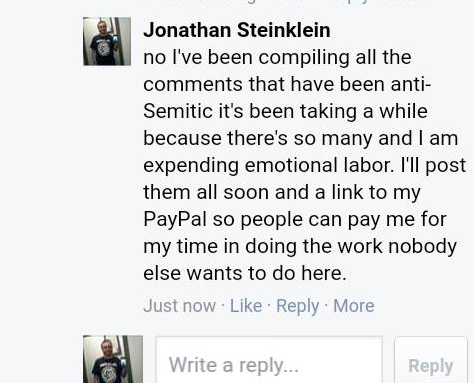 I even posted my PayPal for emotional labor! It took me about 20 minutes to compile all the anti-semitic comments and I started posting them and why they were anti-semitic. 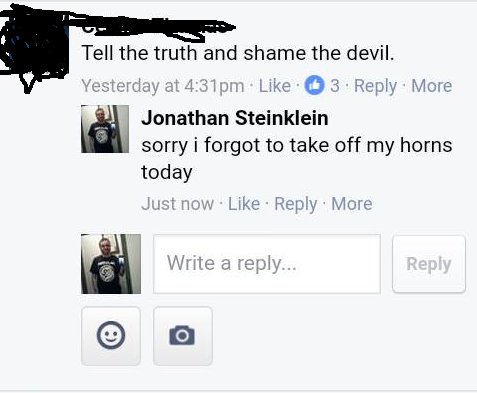 After I got to the second anti-semitic comment, I found out I was blocked from commenting on the page and all of my work was for naught. As of now, all the anti-semitic comments are still there and there is no criticism by either the moderators of The Love Life of an Asian Guy or other people who like the page for that matter. 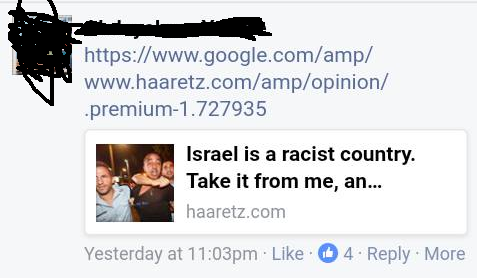 I will post all of the anti-semitic comments on this post on The Love Life of an Asian Guy’s page and explain why they are anti-semitic. Most Jews are Diaspora Jews (meaning not living in Israel) so associating Jews with the bad things Israel does is anti-semitic. If you would not associate Muslims with the bad things ISIS does, do not do the same for Jews and Israel. The Jewish community is not homogeneous. 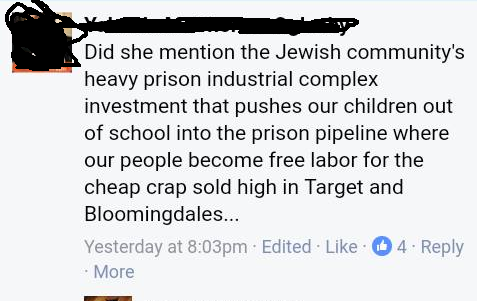 I tried googling to see if *a* Jewish community had invested in private prisons. I could not find anything but if you are making a claim about the “Jewish Community” that cannot be verified, it is probably based around stereotypes and anti-semitic. This is a classic anti-semitic trope and patently untrue. 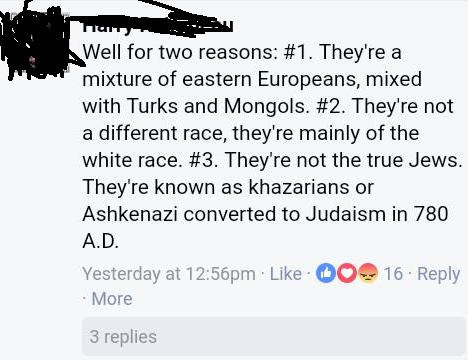 White or light skinned Jews are not Khazar converts. Their genetics stems from Israel. 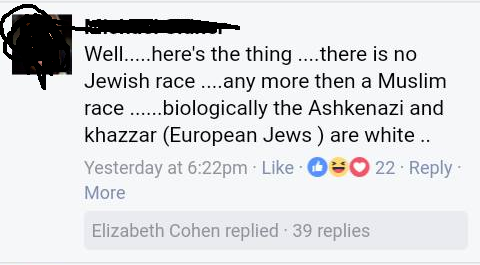 Thanks for thinking Jews are lying about their heritage though. This is anti-semitic because it assumes white or light-skinned Jews are lying about their heritage. 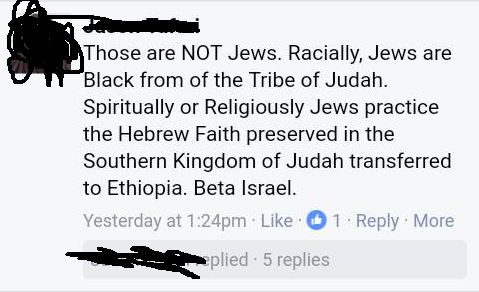 Another case of someone saying Jews are lying about their heritage and aren’t actually Jews as compared to Hebrew Israelites which are really just Black Jews. 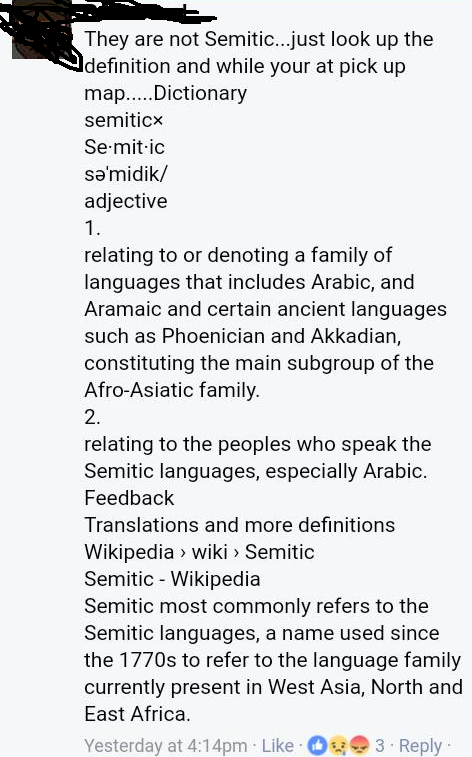 Jews are Semitic. Hebrew is actually closely related to Arabic as a language. So this is patently false but they are also accusing Jews of lying about their heritage. Another case of someone accusing Jews of lying about their heritage. Ethiopian Jews and Diaspora Jews are both Jewish. 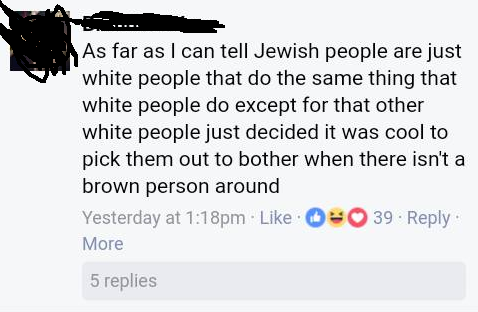 Jews (excluding Jews of color) are not just white people that do the same thing as white people. They have a rich culture that spans thousands of years. Most Jews do not live in Israel and should not be held accountable for Israel’s actions against Palestinians. To expect Jews to apologize for Israel’s actions is anti-semitic. 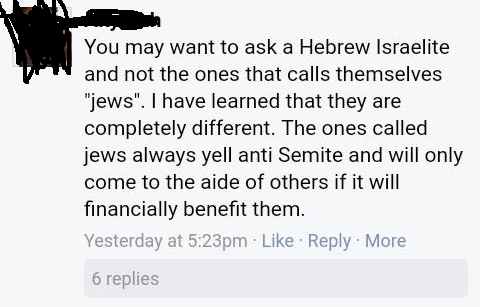 A case of someone saying Jews pull out the “Jew card” when it is convenient. Also, most Jews can trace their lineage which is different than White people who claim Cherokee heritage. Another person accusing Jews of lying about their heritage. It seems this happens a lot on this page. The moderators of The Love Life of an Asian Guy page should be addressing these anti-semitic comments but they have not and that means they are giving a platform to anti-semitism and condoning anti-semitism. As a political Jew, you learn pretty quickly the horseshoe that bonds the Western left and right wings of politics is usually based around hating Jews. These comments reflect anti-semitism by radical, woke folks that is prevalent all over anti-racist Leftist spaces. With the rise of Neo-Nazis and the Alt-Right all over the United States and Europe, solidarity with Jews is extra important and Jews should do their best to match that solidarity with other marginalized groups. If you cannot be in solidarity with Jews and call out anti-semitism in your spaces, then just keep our name out of your mouth. More often than not Jews just want to be left alone and people like The Love Life of an Asian Guy who cannot do that actively contribute to harm. Jewish MSW graduate and licensed social worker who cares about social justice and cats.